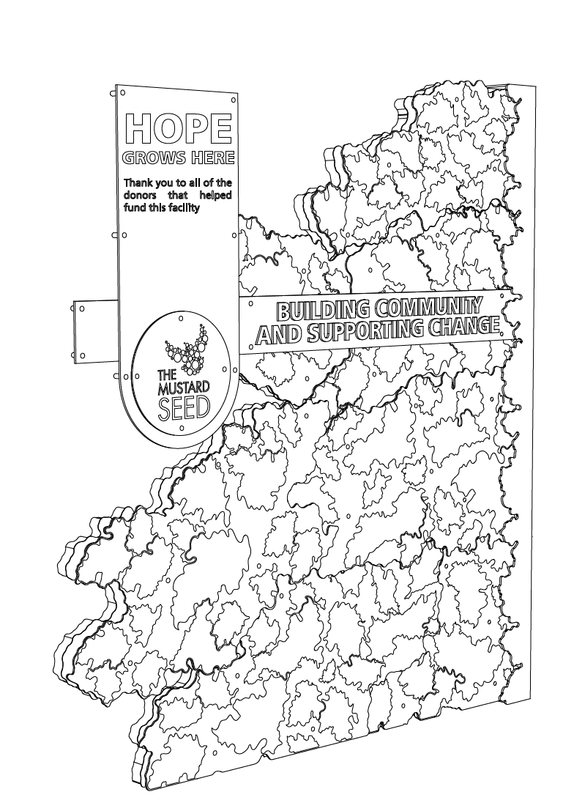 Last year, we were contacted by The Mustard Seed. For those of you who don’t know, The Mustard Seed provides the homeless with basic needs like food and shelter, while also helping to find sustainable ways of improving their lives, like employment. Needless to say, The Mustard Seed’s mission is one that BetterGiving can wholeheartedly stand behind. 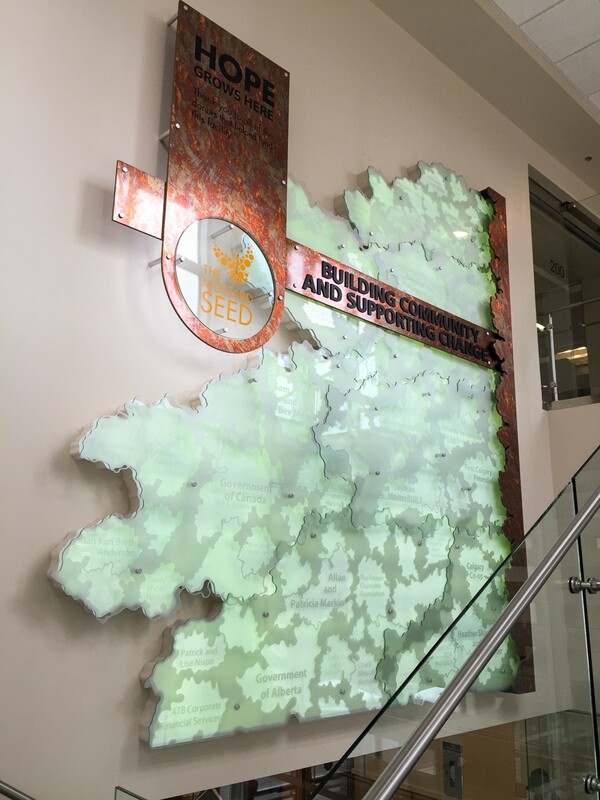 The Mustard Seed wanted something prominent, in a unique space, and something that showcased their supporters in a creative way. 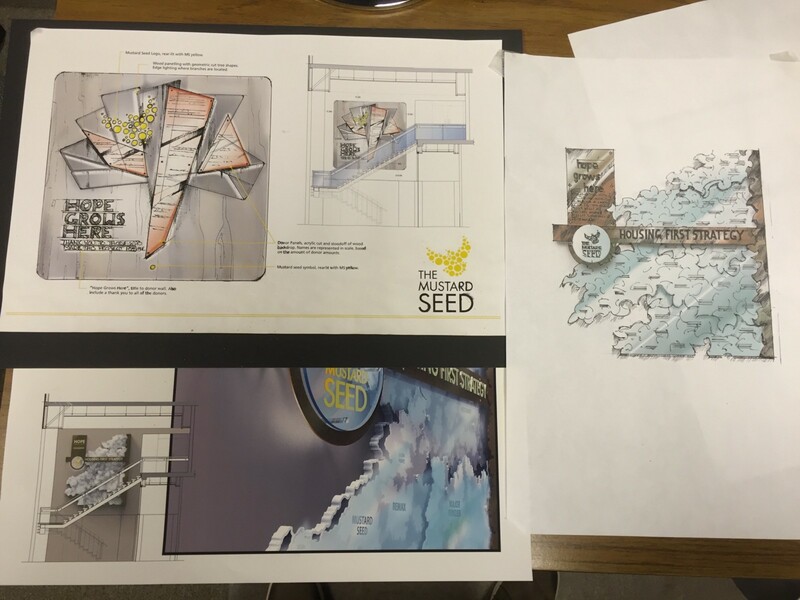 The Mustard Seed team really seemed to like the right-hand concept, so that was our focus moving into the next steps. Since this wall was so large (14 feet tall! ), we actually built a smaller, desk-sized prototype wall. Uses acrylic, though you’d think it was glass by looking at it. Acrylic makes the wall lighter, more durable, and extremely cost-effective. Also used: petina copper, and etched vinyl on acrylic, custom backlighting. Layered with anodized aluminum standoffs from Standoffs.ca. 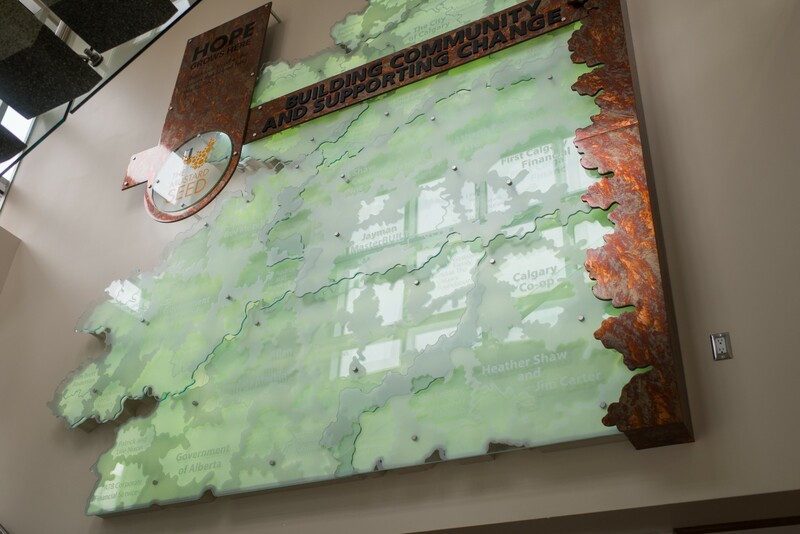 Donors are positioned on individual leaves, with an acrylic naming system. This allows The Mustard Seed to change a donor’s information, in the event of a marriage or business rebranding (a great feature for corporate donors). Built custom to fit inside the limitations of space created by TMS’ staircase. If you’d like to do something like this, or this post has given you ideas, email bryce@bettergiving.ca. We’d love to chat! To see more examples of our awesome work, click here to be taken to the BetterGiving homepage. We make nonprofit fundraising and retention easier by merging physical and digital elements to create amazing donor recognition projects.